Hello and welcome to THIS – a blog dedicated to the best film of all time. That’s right. 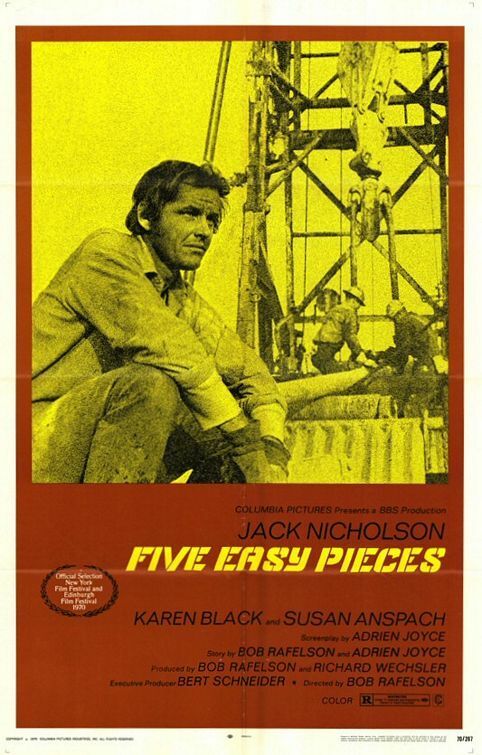 Five Easy Pieces. Starring Jack Nicholson. Sure, it may not be über-famous – I daresay only a few of you have heard of it – but it’s a haven of cinematic perfection that emerged from a purple period of independent filmmaking. Oh yes it is. I must have been in my mid-teens when I first saw it. Jack Nicholson was mesmerising, agonised and unfulfilled. Which is exactly how I was at 14. The film is a psychological drama focusing on Nicholson – childhood-musical-prodigy-turned-disaffected-blue-collar-worker-suffering-existential-crisis-exacerbated-by-clam-like-stop-gap-girlfriend (Karen Black). On learning his father is sick he returns home. Something about 5EP resonates so strongly with me – probably something to do with fathers and sons – that I have always cited it as my favourite film when asked (silly question but at least it’s an answer). When I grew up I robbed a bank and purchased the original poster from the highly exclusive Reel Poster Gallery on Westbourne Grove, fancy London (they frame it for you too, you know). When I drove into town to collect it I parked up, entered the shop and spent ages eying up an Italian-language poster for Psycho – so long in fact that when I finally returned to my car I found I’d received a parking ticket. So yes, that’s right – the poster cost me even more than the-already extravagant fee. Oh the humanity. Where is the poster now, Saul Wordsworth? The poster hangs proudly in my flat, the film close to my heart (does that work? Not sure it does). It’s been digitally remastered (the film, not my heart), touched up (easy now) and generally lavished with love. I recently attended its 40th anniversary re-release on behalf of the good people at Rhythm Circus. Let’s end with a touching scene between Nicholson and his ailing father. Yes let’s.